Do your necklace chains always get tangled? Forgot to stock up on silver polish? Can't fasten that tricky bracelet? Then read on. These nifty shortcuts won’t just make wearing and caring for your jewellery a doddle. They’ll actually make your whole life easier! Knotted necklace chains are a real pain. Most people will use a pin inserted into the knot to loosen it, but this can take ages. So here’s a really clever tip for you – add baby powder for much quicker results! Forget silver polish… here’s how to get that sparkle back in your silver jewellery with items you can find in your own kitchen. Instructions: Take a clean, medium sized ceramic bowl. Put some tin foil on the bottom, shiny side up. Fill the bowl with water, add a teaspoon of baking soda, a teaspoon of salt and a dash of white vinegar. 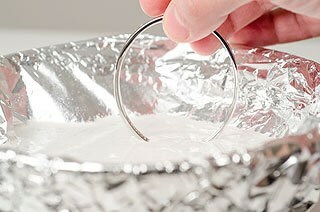 Place your silver jewellery in the mixture for five minutes, then take it out and carefully rinse with water. Your silver jewellery will have its shine back! WARNING: DO NOT USE THIS TIP IF you’re cleaning mixed silver jewellery with gemstones, pearls or any other delicate materials. The vinegar solution could damage them. If unsure, revert to jewellery cleaning agents or professional cleaning. Securing the clasp on a bracelet all by yourself can be really frustrating… Just as you’re about to snap the darn thing on, one end slides off your wrist and you have to start all over again. Well, not any more. Here’s a great way to use a paper clip to put on your bracelet quickly and easily. 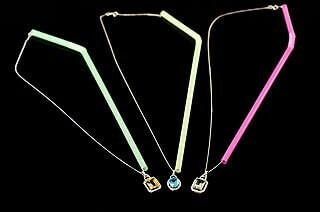 Keep necklace chains from knotting… with a straw! 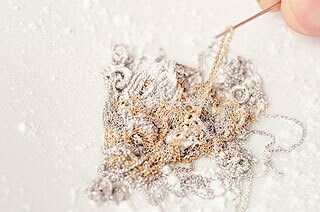 Instructions: Thread your necklace or bracelet through a straw and close the clasp. Hey presto – you’ll have tangle-free jewellery wherever you go! Just remember to store gemstone and diamond jewellery in separate bags because they could scratch and damage each other. If you have long hair, you know what this is about! You put on your favourite necklace and halfway through the day there’s a dreadlock tangled up around the clasp. It’s painful (and near on impossible) to brush out… But no more! Instructions: Buy a short length of aquarium tube from any pet shop. 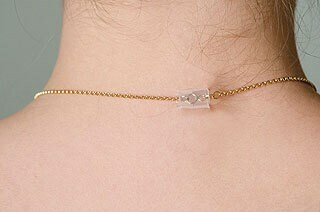 Cut off a small piece just big enough to cover your necklace clasp, then slide it onto your necklace chain. Fasten the clasp, then work the piece of tube carefully back over it. This will keep your hair from tangling in it. We hope you enjoyed these amazing jewellery hacks, courtesy of TheDiamondStore.co.uk!